According to Internet statistics 300 000 new users daily join the World Wide Web. Only one of a hundred of users becomes the owner of his site and only one of a thousand of site owners starts a business in Internet. All Holy Land Wines is a young company, which successfully develops new commercial relations in World Wide Web. We offer all Internet users – our potential customers – to purchase in any country of the world wonderful kosher wines made in Israel. The owners of the company are members of the family coming from Georgia (a state in the Caucasus) that is famous for its old traditions of wine making. 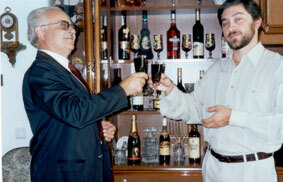 Doctor of History, Ephraim Ankori and engineer Alexander Yakobi, using their vast experience in communicating with wine-makers and wine merchants in Georgia, opened an Internet shop specializing in the selling of Israel kosher wines, liqueurs, brandy and grape juice. Office of the company is located in young nice town on the shore of the Mediterranean See.